… how free are YOU today? On 15 June 1215, King John met with the barons at Runnymede to sign a document that would ensure the freedom of the Church, the liberties of the barons, and make himself equally subject to the law: Magna Carta. 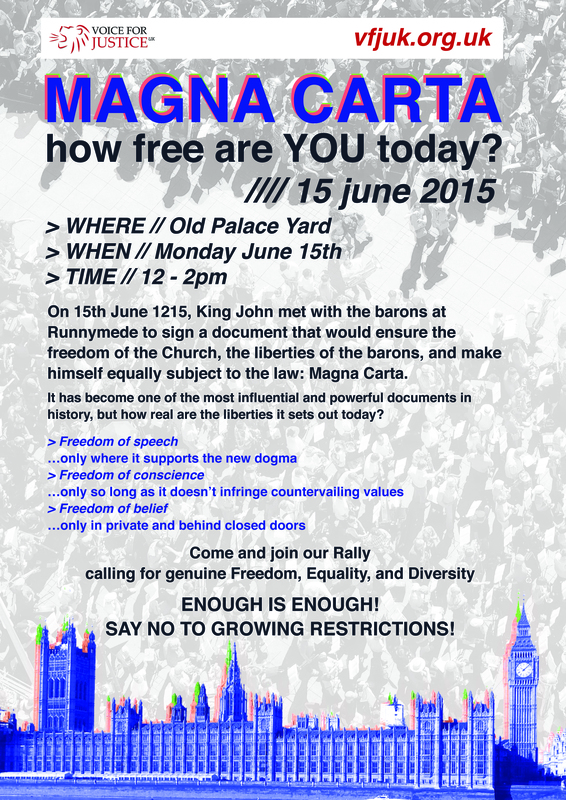 This year we celebrate its 800th anniversary, but how real are the liberties it sets out today? The truth is that Christians are being increasingly marginalized and gagged! Speakers so far include: Baroness Cox, Dennis Wrigley (Maranatha), Andrea Williams (Christian Concern), Alan Craig (political campaigner and former leader Christian Peoples Alliance), Edmund Adamus (‎Director for Marriage & Family Life, Archdiocese of Westminster), Lynda Rose (VfJUK). More to come! Dress up, or come as you are. Tell your friends and bring a bus load! Join us and make our voice heard!